mods : please make this one as a sticky. If the forum can handle child / sub forums, I think it would be ideal to have this as the main entry, and then have below "nova config files", "bug list", "what do you want in your CF" etc. This will reduce the amount of sticky in the Saber Sound section. Please post only GOOD TIPS, VISUAL AIDS / TUTORIALS, ANNOTATED PICTURES or ILLUSTRATIONS. PICTURES MUST BE STORED ON A PERMANENT WEBSITE (no flickr, no imageshack etc), or ATTACHED to the post (aka stored on TCSS). This is NOT a discussion thread but a knowledge base, so please don't make the page number grow up for no reason. 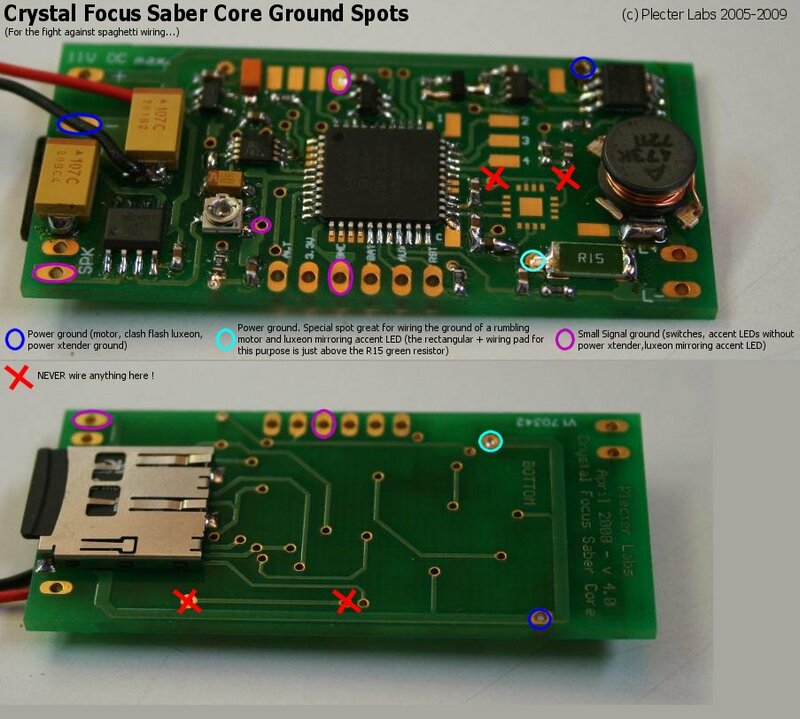 here's what MadCow requested a couple of days ago : CF ground spots, aka where you can solder your ground wires. Beware, not ALL ground spots can be used for everything. The "veterans" have seen this before... but the newcomers will probably not know about it. It is by no means "uber ultimate pro" nor is it for the "greenhorn n00bitizer". Oh, and if you're looking for a "magic" wiring guide that shows you how to do CF to the nines all in <10 minutes... ... uh, as Han might say... good luck... yer gonna need it! * Free camel included. With purchase of 3 CF boards from Ali Fakir. Totally kidding, only a free saurus is included. Never mind, sauruses are out of stock, sorry. The sauruses ate the camels (they were thirsty), so you'll just have to lump it... and don't be a saur loser.